Today’s official launch of the Lens Creative Partners Program includes more than 30 "creators", which comprise large ad agencies, smaller AR shops and individuals. Globally, R/GA and Grey are part of the programme, as well as Sir Martin Sorrell’s recent aquired content shop MediaMonks. In the UK, network agencies such as Adam & Eve/DDB, AKQA and Wunderman have signed up, as well as independent shops Wieden & Kennedy London, VaynerMedia and We Are Social. US partners include Red Interactive, which has created a Lens for Under Armour, and Block Party, which has made work for music group The Chainsmokers. 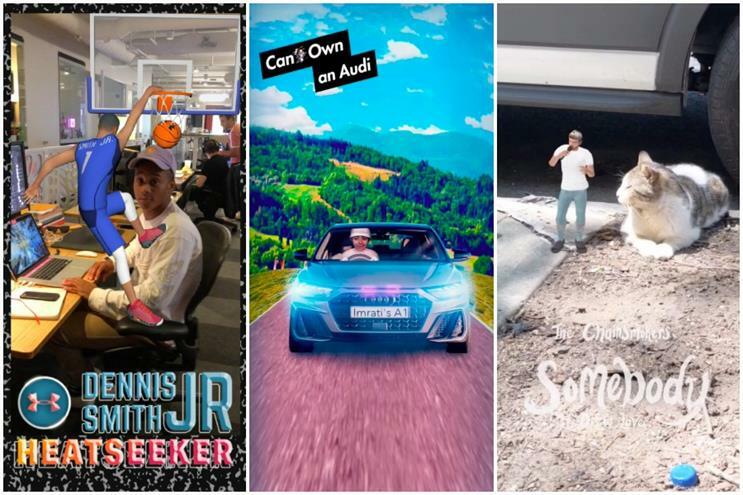 Snapchat parent Snap wants to give brands easy access to expert AR ad creators – a key part of the ephemeral messaging platform’s business. It claims that more than a third of its 186 million daily active users play with AR Lenses on the app each day. Lenses were launched in 2016 and prompted a flurry of brand activity from the likes of Nationwide, EE, Virgin Media and Burberry, which sponsored Lenses or filters. The format has since evolved with last year’s 3D World (object) Lenses, following the viral dancing hot dog meme, and this year’s Shoppable AR Lens that added a button to drive an action. Snap Pixel, which was released for all advertisers in June, allows brands to measure the ROI of their AR ad by tracking the purchases made after engaging with it.